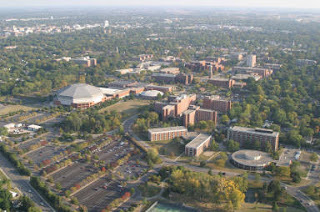 A new collection of aerial photography is now available on the Ball State University Libraries’ Digital Media Repository at http://libx.bsu.edu/. The Roger Conatser Aerial Photograph digital collection currently contains over 1500 aerial views of Muncie and Delaware County, Indiana, taken by Muncie resident Roger Conatser in 2005. The collection will grow to include aerial photographs from 1985 through 2005. The Roger Conatser Aerial Photograph digital collection documents the landmarks and landscape of Muncie and Hartford City. The digital images of Muncie include the central business district, Ball State University, Ball Memorial Hospital, churches, schools, agricultural areas, shopping centers, the White River, Cardinal Greenway, the Minnetrista Cultural Center, parks, industrial sites, and major roadways. The courthouse square, agricultural and residential areas, industrial parks and major roadways of Hartford City are also included in this collection. For more information about the Digital Media Repository, please contact the Archives and Special Collections at 765-285-5078.